Having the perfect bedroom furniture is essential in making your bedroom functional and comfortable. Since dressing tables have become a popular addition to many modern bedrooms, we cannot imagine the space without a nice and beautiful bedroom stool or vanity stool. The furniture market is filled with a range of bedroom stools in a variety of colors, styles, designs, materials, price and quality. Why do You Need Bedroom Stools? Having extra seating in any room of your home is an advantage, and bedroom is not an exception. 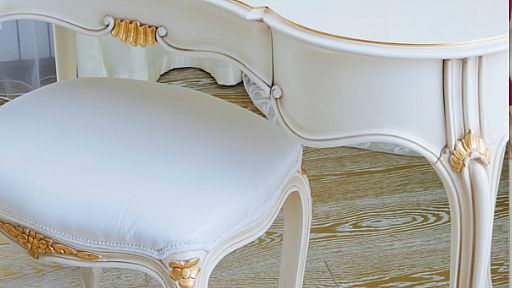 Even though most of the dressing tables come with bedroom stools, you can buy a more perfect piece that may help you in creating a more personal and comfortable area. Beautiful bedroom stools complement the dressing tables and will enhance its function as the source of a comfy personal area to prepare. Comfortable seating area is an unavoidable furniture element in any modern bedroom. Having bedroom stools in your room will not make the space congested or cluttered thanks to the compact design. These vanity benches come without arm rests or back support and hence can be easily placed under the dressing tables when not in use. This simple piece of bedroom furniture, though appear to be very simple and petite, can make your preparations for the day or a special night out effortless and comfortable. A stool with a cozy seat in front of the mirror can make you feel relaxed and equipped to face the world. Women may find it extremely useful since having a personal place to prepare for the day forms a vital aspect of her existence. Vanity benches or bedroom stools are available in both contemporary and traditional designs and styles, and you can choose those pieces that enhance the look of the existing furniture. You can pick these stools from the catalogue of a nearby retailer or online stores. Many reputed retailers stock great selection of bedroom stools from many well-known brands. Remember to match your existing dressing tables with a pretty and versatile bedroom stool. Bedroom stools are available in a range of materials ranging from hardwood, softwood and metal. Remember that depending on the material and design, price will also vary. There are numerous simple and inexpensive bedroom stools available. See to it that whatever variety you are choosing, it should be durable. Flea markets and garage sales online are excellent sources of inexpensive bedroom stools. If you feel the current vanity stool in your bedroom does not match well with other components, you can easily update it by reupholstering. Bedroom stools are available on a choice of fabulous high gloss vinyl colors and wood grain finishes complementing the color of your bedroom and other bedroom furniture. You can even choose those stools that are furnished with snug cushion fabrics. Bedroom stools with intricate and detailed designs and carvings are also available if you want to match the piece with existing Victorian style bedroom fittings. Bedroom stools with interesting designs are also available such as cube style, bench style, piano stool etc. Bedroom stools that complement or contrast your bedroom design can serve as aesthetic enhancing elements of the space.